I wrote then about the way this statement affected me personally. (Among other things, it made me cry quite a bit.) Thinking more about this scene, and the movie in general, another line in the film struck me. 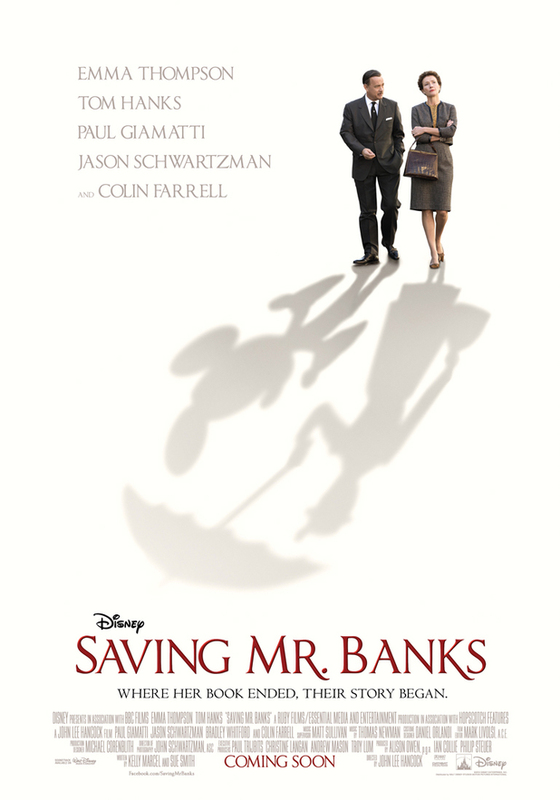 Throughout the movie, which shows Walt Disney doing his utmost to convince Mrs. Travers to allow him to make a film out of her Mary Poppins book, Disney again and again says that he wants to “make something beautiful” out of her story. And he does not just want her permission to do this. He wants her help to do it. How many of us use the word “beautiful” in conjunction with a film? Really, how many of us do that? I know I do not use the word “beautiful” to describe a movie. In fact, listening to Disney say it, I was inclined to squirm a little. How can a movie be “beautiful”? We do not use “beautiful” very much these days, readers, with regard to stories. Whether they are in print, song, or on film, “beautiful” is an adjective rarely attached to a story. Or, if it is applied, it can sometimes be applied to a film for the wrong reason. I cannot say that about the story in Avatar, which is simply cowboys and Indians on another world. And the Indians win. I believe that I have watched Avatar a total of two or three times since a friend sat me down to see it first. In contrast, I have watched Mary Poppins too many times to count since I was introduced to it as a child. Of late I have not watched it as much, but compared to Avatar, I would say that the story of Mary Poppins is a “beautiful” story. The story in Avatar I would call, politely, “mediocre” – at best. So why would Disney call a prospective Mary Poppins film “something beautiful”? He would say that because a good story, just like a good photograph, painting, or song, is an expression of beauty. Beauty lifts us up. It reminds us of what is good, true, and permanent. That there is more to life than what we see, and that we rarely experience the “permanence” we can often feel but are rarely allowed to see with our eyes. Parents often complain – laughingly – that their children almost endlessly watch a particular movie or movies over and over again, until they (the parents) are well and truly fed up with it. Why do children do this? Why do they watch the same film(s) time after time, when they know every line by heart? I would guess it is probably because children have a sense that attracts them to beauty, which is crushed – or tamed – out of them as they grow up. I remember watching lots of films several times in the same week as a child. I never got tired of them. I enjoyed new stories, but the older stories were my close friends, and I did not want to leave them out of my fun. Today, however, many storytellers – whether they work in the medium of print or film – are running away from beauty. There are others who embrace it, such as those at Disney, if only because it is their bread and butter. Others continually try to tear it down and destroy it. Do you want proof of this? Check out the films that have come out recently. Along with the latest Marvel films, Disney’s Maleficent, Cinderella, and Frozen, we have such movies as The Purge, The Purge 2, The Hive, Gallows, and other trash. Yes, I called those films trash, and I will do so again. They are garbage, the vile refuse of small minds that take pleasure in “tearing the old world down,” to quote Alexander Pierce of Captain America: The Winter Soldier. Pardon me a moment, readers, but this is nonsense. No, actually, it is worse than nonsense. It is lies. Art is not a collection of carpet fluff glued together to resemble a poodle. Art is not a bed covered in empty vodka bottles or a canvas someone spilled thirty cans of paint onto, and art is NOT anything like The Purge or The Hive. Art is a manifestation of beauty. Everyone can see and recognize beauty, and they can either love it or hate it. Everyone who loves beauty is gifted with expressing it in some way, from a waitress smiling at a customer to a director doing his utmost to turn a great book into a remarkable film. And everyone who hates beauty will try to destroy it. They will try to destroy those who use their talents to express beauty. One of the first targets, therefore, will be the painters, songwriters, storytellers, and others who make beauty visible for all to see. These haters of beauty try first to shout and beat these great artists into submission. Finding that shouting does not work on all, they instead whisper and sneer, making themselves look reasonable and more real than the beauty these artists portray. Everyone says they can make art. And someone who makes a good movie, writes a good book or a song, or paints a beautiful picture, has proved their worth. But those who paint death, horror, destruction, and malfeasance of every kind yet call it “art” are liars, cads. They are the Wormtongues of our age, the useful puppets of the Sarumans that feed them the falsehoods and monstrosities they then display for all to see. No longer is a storyteller believed to bring order to a chaotic, brutal world and give people a taste of what true reality looks like. No longer is a storyteller expected to bring hope to the people again and again, to give them characters that will live forever, safely cherished in the viewers/readers hearts. No. Instead, the Sarumans say storytellers are supposed to revel in the transient. They are expected to give form to passing feelings, fleeting fads, and to lift up the slime at the bottom of the gutter and proclaim it art. This is now the anticipated path of an artist. G. K. Chesterton said on his deathbed that there was only the light and the dark, and every man had to choose which he would serve, for which he would live and die. What do these sides, the light and the dark, look like? Look to your heart, readers. Who rides there? Captain America? Aragorn? Luke Skywalker? They are the emblems of the light, the ideals of those who choose goodness, right, and truth. They are what these people truly strive to be. All who live according to the light, who love the day and the stars at night, they fight for the light. They are the true Avengers, the real Fellowship of the Ring, and the living Jedi Knights. To believe in beauty, to fight to keep it present in the world – that, readers, is choosing and fighting for the light. What do those who serve the darkness look like? Whom do they carry in their hearts? Loki, Saruman, Hannibal Lecter, Thanos – these are examples of the outriders of evil. It is these who are carried in the hearts of those who serve the darkness. They, like these characters, have rejected the light. For them it is better to rule in the dark than to serve in the light. Non serviam, they say. Those who are minions of evil resemble these wicked characters in some manner. “You lack conviction,” was Coulson’s prompt, true answer. Why would evil wear a mask if it were so utterly convinced that it had nothing to fear? Evil wears a mask because it does have something to fear, something far greater than itself. The Light is what it fears, and for that reason true storytellers serve the Light. This is why I blog about stories which I know are beautiful. This is why I blog about characters and songs I know to be beautiful. This is why I write. There is no other reason for this blog. If there ever was another reason, it has long since passed away. Writing about beauty is one way of making beauty visible to the world again and again. Of bringing order, if only for a few paragraphs, to a chaotic society. Of giving hope, however small, where it is needed most. This entry was posted in Movie Reviews and tagged Agent Phil Coulson, Aragorn, Avatar, Beautiful, Bradley Whitford, Captain America/Steve Rogers, children, Cinderella, Colin Farrell, Cowboys and Indians, Crossbones, Deathbed, Emma Thompson, Frozen, G. K. Chesterton, Gallows, Good and Evil, Grima Wormtongue, Hannibal Lecter, Helen Goff, James Cameron, Jason Schwartzman, light and dark, Loki, Luke Skywalker, Maleficent, Marvel Comics, Mary Poppins, minions, Movie Reviews, Mrs. P. L. Travers, Nebula, Noah, Paul Giamatti, Sam Worthington, Saruman, Saving Mr. Banks, Sir Galahad, Star Wars, storytellers, Thanos, The Purge, The Purge 2, Tom Hanks, Walt Disney, Zoe Saldana on January 15, 2016 by The Mithril Guardian.